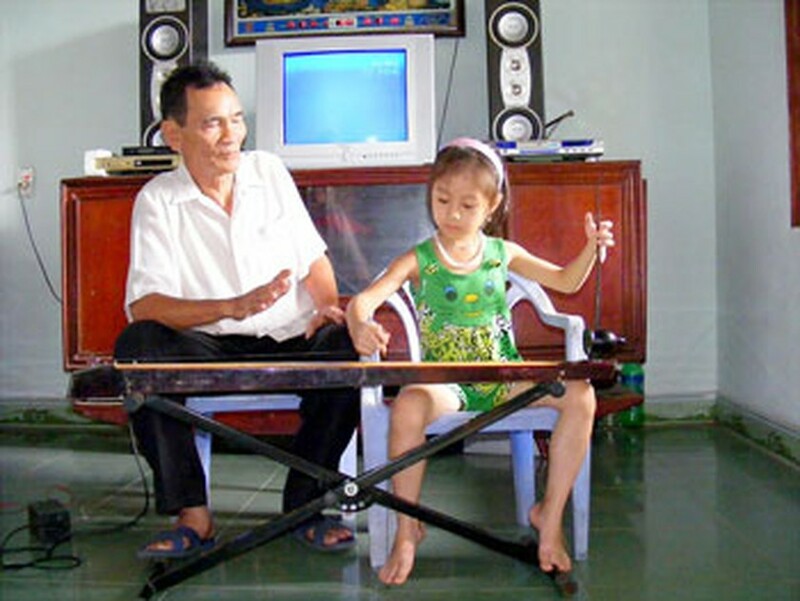 Ngo Hoang Anh, a 6 year old girl from the northern province of Nghe An has left a deep impression on people with her talent to play the dan bau , a Vietnamese one-string monochord instrument. Hoang Anh took her first dan bau lesson a year ago from her grandfather, musician Ngo Khac Duy who served in the Nghe An Province Volunteer Youth Force. He is one of the members of the Ca tru singing club in Dien Chau District. Within just three months, Hoang Anh could play extremely well. Her grandfather was surprised at her prowess and skill of the Vietnamese traditional musical instrument. Musician Ngo Khac Duy along with Cao Xuan Thuong, head of the Dien Chau Culture and Arts Association recorded her playing the instrument on a ‘homemade’ CD. They recorded 12 folk songs besides a few other works. Hoang Anh and her younger sister live with their grandfather, while her parents are working in Laos. She is an active, vivacious and intelligent little girl. She is the pride of the local people who usually come to her house to hear her play the musical instrument. This only shows that despite the influx of modern westernized music, young people still hold an interest in traditional Vietnamese music.